All of us are slightly different in regard to what we need to be our healthiest selves — that’s why the House of Nutrition in Poughkeepsie is proud to provide a wide selection of competitively priced vitamin supplements. So whether you have food allergies, vitamin-rich foods are out of season, or you just don’t want to manage your diet that closely, House of Nutrition, your local vitamin supplement store, has you covered. Our bodies are complex organisms that need a wide variety of vitamins, minerals, and nutrients to maintain proper functions. Without these “ingredients” for a healthy life, you can end up feeling sluggish and fatigued, suffering from symptoms like stiffness, unexplained joint and body pain, and headaches, and even increasing your risks of serious illness and disease. So how do you know if you are getting enough of what you need? We recommend referencing the U.S. Food and Drug Administration’s guidelines (FDA) and talking with your primary care physician about any conditions, medications, or circumstances that may cause you to have different than usual needs. 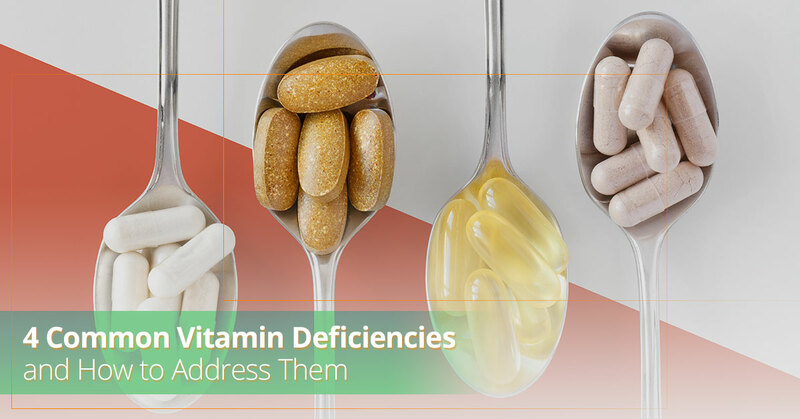 Below, we will explore 4 of the most common vitamin deficiencies that Americans face according to a report by the Center For Disease Control (CDC), why the vitamin is important, and what you can do to make sure you get enough of it. Vitamin B6 is part of the B series of vitamins that supports normal brain growth and development, a healthy nervous system, and a strong immune system. Who’s Deficient? According to the CDC, roughly 10.5% of Americans over the age of one have a vitamin B6 deficiency. Ways To Address Eat vitamin B6 rich foods such as milk, spinach, salmon, tuna, eggs, sweet potatoes, bananas, and carrots, or add a B6 vitamin supplement from House of Nutrition to your diet. Other Notes Consult with your doctor or one of our nutritional specialists to find out what the right level of B6 supplement is for you, as high levels of intake of an extended period of time can have negative side effects. Even though iron isn’t actually a vitamin — it’s an essential mineral — it makes our list because of the number of people who have a deficiency, and the importance of iron for a healthy life. Iron is a primary ingredient in hemoglobin, the part of our red blood cells that transport oxygen from our lungs to the rest of our body. Low level of iron can cause types of anemia, fatigue, and the inability to build muscle and heal at a normal rate. FDA Recommended Daily Intake This varies greatly depending on your age, gender, lifestyle, but typically 18mg per day will be plenty. Who’s Deficient? 9.5% of American women between the ages of 12 and 59. Ways To Address Eat foods that are rich in iron such as shellfish, red meat, quinoa, spinach, liver, and legumes, or add an appropriate dosage of an iron supplement from House of Nutrition into your diet. Other Notes Consult your pediatrician for determining what the right level of iron is for your child, as children are less capable of handling high levels of iron, which can be very dangerous. Also known as ascorbic acid, vitamin C is a powerful antioxidant and is important for maintaining a healthy immune system. Furthermore, vitamin C enables our bodies to more readily process iron, which can help address iron deficiencies. There is also some research that suggests there is a connection between healthy levels of vitamin C and lower blood pressure, although this is not proven as of yet. Who’s Deficient? Roughly 6% of American over the age of six. Ways To Address Eat foods that are rich in vitamin C such as oranges, strawberries, kiwis, bell peppers, broccoli, kale, and spinach, or add in a C vitamin supplement from House of Nutrition. Other Notes Vitamin C is a water-soluble vitamin, meaning the body can’t store it, and while you need it daily, doses of over 2,000mg are generally not recommended. Vitamin D is a crucial part of maintaining healthy bones and has been linked to increased muscle strength, a healthy immune system, and even helping to prevent cancer and type II diabetes. Unlike the other vitamins on our list, vitamin D is tougher to find in high levels naturally, and many Americans use a vitamin D supplement to make sure they are getting what they need. Who’s Deficient? 8.1% of Americans over the age of one. Ways To Address Eat foods that contain vitamin D such as fish liver oils, fatty fish, mushrooms, egg yolks, liver, and milk (which has vitamin D added to it) or get an appropriate level of D vitamin supplement from House of Nutrition. Other Notes Vitamin D is created is in the skin through healthy levels of exposure to direct sunlight. People who live in areas with fewer than average sunny days per year (such as the Pacific Northwest) tend to have higher rates of deficiency. Additionally, people with darker skin pigmentation, which reduces the effects of the sun, also demonstrate disproportionately higher rates of vitamin D deficiency regardless of where they live. If you have questions about any of these vitamins or minerals, or just any questions about how vitamin supplements can help you feel better and be healthier, give us a call. House of Nutrition has been in the health space for over 50 years, and our dedication and experience is second-to-none. Our certified nutritionist will be happy to consult with you and help you find the right supplements to meet your needs.